BHK OF AMERICA, well known as one of the woodworking industry's largest manufacturers of a full line of ready to assemble DuraWrap® and wood drawer systems, also offers its quality line of innovative flooring products. A faster, cleaner installation is achieved with the moderna Glueless Flooring System. Beautiful looks with exceptional performance characteristics in a wide selection of colors and patterns are availiable from both product lines along with a lifetime warranty against, wear, fading and stains. New "Water Warranty" is also available. BHK facilities are located in Central Valley, New York and South Boston, Virginia. 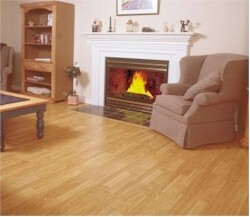 The moderna Glueless Flooring product line is available through a strong nationwide distribution and dealer network.